There are probably as many ways to make tabbouleh salad as there are cooks in the world. The dish hails from the eastern Mediterranean, but has spread to many countries, among them France. When I first arrived here (full disclosure: 40 years ago), the taboulé served in Paris mainly used couscous as a base. But this more traditional recipe uses bulghur, which marries beautifully with the salad’s tomatoes, parsley and mint. Even so, this recipe differs from what some might consider true (Lebanese) tabbouleh in that it contains more bulghur than herbs. Chefs like the wonderful Yotam Ottolenghi recommend the opposite — mainly parsley and mint, with just a smattering of bulghur — but I’ve tried it both ways and prefer to use more of the grain to produce a more satisfying salad. You can experiment to find your own favorite mix. 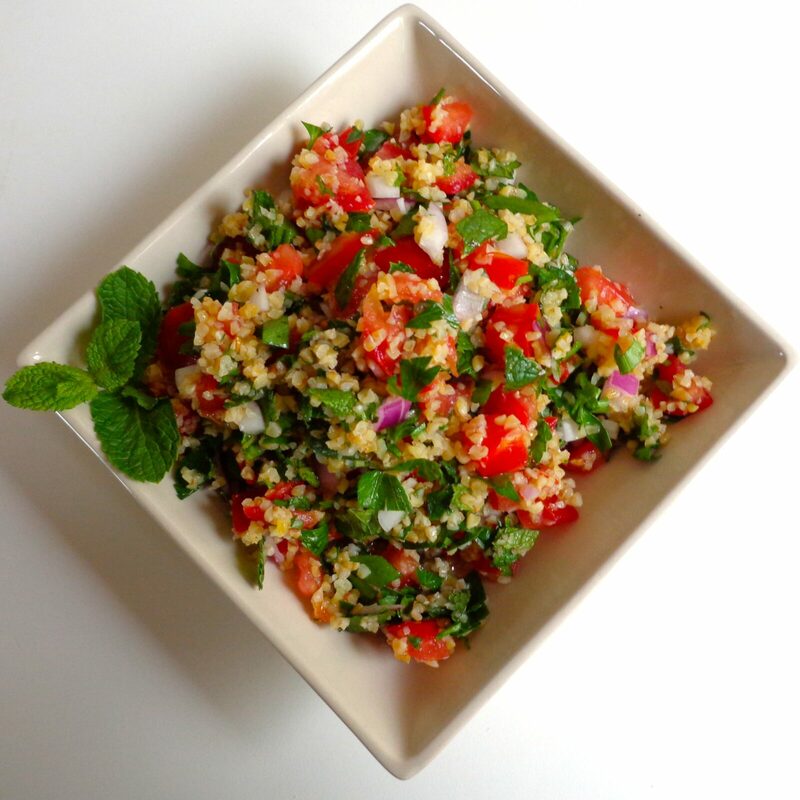 Tabbouleh works well as a lunch dish, as a salad alongside grilled meat or fish, or as part of a buffet assortment of Mediterranean-style foods. You could pair it, for example, with eggplant caviar, Moroccan carrot salad, chick pea salad or a simple mesclun salad with hints of Provence. Whatever you like. It’s the height of summer, the rosé is flowing, we’re at the beach, and I have only one thing to add: Enjoy! This entry was posted in 3. 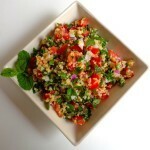 Salads and tagged bulghur, mint, parsley, recette, recipe, salad, tabbouleh, vegan. Bookmark the permalink.